In his inaugural address, he said: " From this day forward, it's going to be only America first. America first." The near meltdown we experienced a few years ago made it clear that our economic health depended on dependence on each other to do the right thing. We are now closer to having an economic community in the best sense of the term -- we work with each other for the benefit of all. Republican states continue to outnumber Democratic states based on residents' party affiliation throughout 2016. Overall, Gallup classifies 21 states as solid or leaning Republican, 14 as solid or leaning Democratic, and 15 states as competitive. That seven-state GOP advantage contrasts with a 30-state Democratic advantage in 2008. Although there are more Republican states, the Democratic states tend to be more populous. As a result, Democrats maintain a slight edge in party affiliation nationwide, 47% to 42%. This Democratic advantage, too, has declined considerably since 2008, one of the stronger Democratic years on record, when Democrats led 52% to 40%. That year, Republican President George W. Bush's job approval ratings hovered around 30% as the nation dealt with the worst economic problems seen in generations, while still engaged in two prolonged wars overseas. In the House, Republicans are now in the midst of a sustained period in which they control more seats than they have since the late 1940s. In the Senate, Republicans not only control 52 seats but have an election cycle in 2018 in which they could, plausibly, approach the coveted 60-vote plateau. Given those numbers, it's not possible to argue that the Democratic Party is the healthier of the two national parties at the moment. Now, the history of politics is littered with parties that overestimated their mandates and within a few years found themselves on the outside looking in when it comes to control of the levers of political power. And there is already some of that rhetoric seeping out of this White House. "The message came through loud and clear that people want forceful leadership," Spicer said Monday of the 2016 election results. That's true — sort of. Trump did win the electoral college. But he lost the popular vote to Hillary Clinton by nearly 3 million votes. And, while Republicans held onto their congressional majorities, they did lose ground in both chambers. At the moment, it's Republicans who have every right to brag about their dominant status as a national party. But always remember that pride comes before the fall. ...Republicans now control three-fourths of all the House districts where whites exceed their share of the national population, while Democrats hold three-fourths of the districts where minorities exceed their national population share. Republicans hold just over 70 percent of the districts where there are fewer white college graduates than average, while Democrats hold almost 66 percent of the districts with a greater-than-average proportion of white college graduates. “It is very hard to argue that there isn’t a structural Republican advantage in the House, that the sorting of voters along lines of urban versus rural, educated versus non-educated hasn’t netted out favorably for Republicans, given the concentration of Democratic voters in a relative handful of districts,” said Patrick Ruffini, a GOP consultant who specializes in demographic trends. Overall, Republicans hold 241 House seats and Democrats 194 in the new Congress, meaning Democrats must recapture 24 seats to regain the majority. Like the stark divisions in the presidential race, these patterns underscore the shifting class and racial basis of each party’s electoral base. From the presidency through lower-ballot races, Republicans rely on a preponderantly white coalition that is strongest among whites without a college degree and those living outside of major metropolitan areas. Democrats depend on a heavily urbanized (and often post-industrial) upstairs-downstairs coalition of minorities, many of them clustered in lower-income inner-city districts. They also rely on more affluent college-educated whites both in cities and inner suburbs. Tellingly, the analysis found, Democrats hold 30 of the 50 House districts with the highest median income—and 32 of the 50 with the lowest median income. But Republicans crush them by 203 to 132 in the districts in between those two poles. A law-abiding person will want to stay as far as possible from the personal service of President Trump. As demonstrated by the sad example of Press Secretary Sean Spicer spouting glaring lies on his first day on the job, this president will demand that his aides do improper things—and the low standards of integrity in Trump's entourage create a culture of conformity to those demands. A wise patriot might be wary of working directly for or near Flynn or anybody else tied to the Russian state, the entities it controls, or Russian business interests. The National Security Council staff has engorged itself to such an enormous size in recent years—now some 400 people—that there are many important roles to fill, safely firewalled away from Flynn. At the other departments or agencies of government, here’s the test: Odds are that the department or agency head will sooner or later be called upon to some improper thing at some point during the Trump administration. Do you trust him or her to say “No”? If not, you may find that improper demand relayed to you—or, even more ominously, you may find yourself involved in actions whose impropriety you only discover too late. And then humbly consider this second troubling question: If the Trump administration were as convinced as you are that you would do the right thing—would they have asked you in the first place? "The appointment of Mr. Bannon is something which is a radical departure from any National Security Council in history," Republican Sen. John McCain, chairman of the Senate Armed Services Committee, said on CBS' Face the Nation on Sunday. "The one person who is indispensable would be the chairman of the Joint Chiefs of Staff, in my view," McCain added. "So it’s of concern, this 'reorganization.'" John Bellinger, an adjunct senior fellow in International and National Security Law at the Council on Foreign Relations and former legal adviser to the National Security Council, wrote on Saturday that the change is "unusual." Trump issued a statement observing Holocaust Remembrance Day. It did not mention Jews. John Podhoretz writes at Commentary that he initially thought it was a sloppy error. Conspicuously, records show Trump holds major business interests in several of the countries excluded from the list, while he doesn’t hold any stakes in the countries on it. Friday’s executive order, signed at the Pentagon, suspends the issuing of U.S. visas or travel permits to people from Iran, Iraq, Libya, Somalia, Sudan and Yemen. (OVERTALK)PRESIDENT TRUMP: No, not at all because they didn't come to me. Believe me. Those were Hillary votes. And if you look at it they all voted for Hillary. They all voted for Hillary. They didn't vote for me. I don't believe I got one. Okay, these are people that voted for Hillary Clinton. And if they didn't vote, it would've been different in the popular. President Trump used his first official meeting with congressional leaders on Monday to falsely claim that millions of unauthorized immigrants had robbed him of a popular vote majority, a return to his obsession with the election’s results even as he seeks support for his legislative agenda. The claim, which he has made before on Twitter, has been judged untrue by numerous fact-checkers. The new president’s willingness to bring it up at a White House reception in the State Dining Room is an indication that he continues to dwell on the implications of his popular vote loss even after assuming power. Mr. Trump appears to remain concerned that the public will view his victory — and his entire presidency — as illegitimate if he does not repeatedly challenge the idea that Americans were deeply divided about sending him to the White House to succeed President Barack Obama. When the courts opened at 9 am this morning, a legal dream team officially filed Citizens for Responsibility and Ethics in Washington v. Donald J. Trump to stop the President from violating the Constitution by illegally receiving payments from foreign governments. Steve Mnuchin, Donald Trump’s pick to be treasury Secretary, failed to list $100 million in assets on his federal disclosure forms. Vincent Viola, nominated to be Army secretary, punched a man in the face at a horse race last summer. The ex-wife of Andrew Puzder, the labor secretary nominee, once appeared incognito on “Oprah” to raise domestic abuse allegations, which Puzder has denied. Betsy DeVos, Trump’s choice for education secretary, struggled to demonstrate a basic comprehension of department policy and basic education terms during her hearing this week. Two nominees didn’t pay taxes on their household employees. [A] dangerous ambition more often lurks behind the specious mask of zeal for the rights of the people than under the forbidden appearance of zeal for the firmness and efficiency of government. 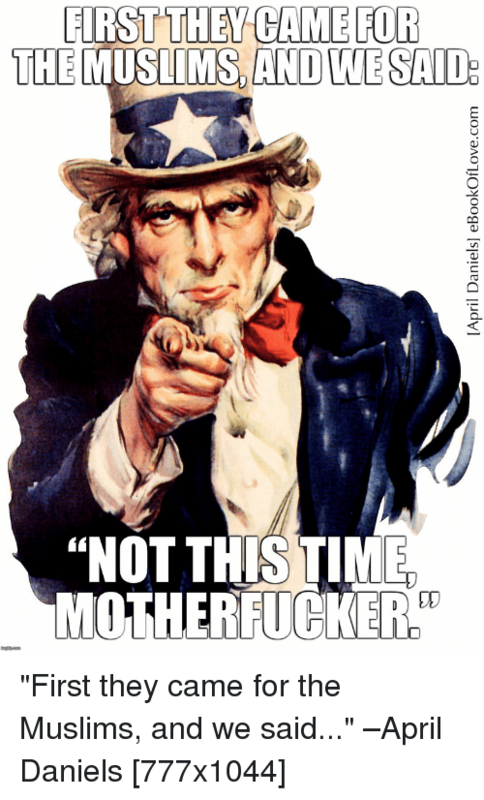 History will teach us that the former has been found a much more certain road to the introduction of despotism than the latter, and that of those men who have overturned the liberties of republics, the greatest number have begun their career by paying an obsequious court to the people; commencing demagogues, and ending tyrants. Donald J. Trump has repeatedly revealed himself as a lying, crooked, narcissistic ignoramus, incapable of generous thoughts or deeds, indeed, incapable of seeing beyond himself at all. The idea of that man living in Lincoln’s house is nauseating. [Underlings] will tell themselves that they have gone to work for the man because they think they can affect him; they will learn—or more likely, their friends and associates on the outside will observe—that actually, he is affecting them. Very few will resign in outrage, because the compromises to their integrity will creep up on them. As Sir Thomas More puts it in Robert Bolt’s A Man for All Seasons,they will be like the man who, having taken an oath, is “holding his own self in his own hands, like water” and when he opens his fingers, “needn’t hope to find himself again.” They will try to open their fingers just a little bit, and it will not work: the water will cascade out. Many of them will never find themselves again, but will instead spend the rest of their careers making excuses for things that once upon a time they understood were inexcusable. The age of Trump will pass. The institutions will contain him and the laws will restrain him if enough people care about both, and do not yield to fear of him and whatever leverage he tries to exert from his mighty office. He may summon up internet trolls and rioters, attempt to sic the IRS or the FBI on his opponents, or simply harass individuals from the Oval Office. But political history tells us that would-be authoritarians usually come to unpleasant ends, their moments pass, and the mobs that cheered them on will come to denounce them just as vehemently. 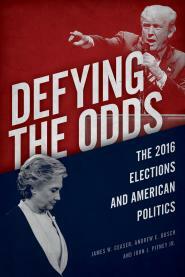 In Defying the Odds: The 2016 Elections and American Politics (forthcoming soon from Rowman and Littlefield), we note that California was an outlier in the election, heavily favoring Clinton, installing Democratic supermajorities in the state legislature, electing a Democratic senator with no GOP opposition in the general election. Hoover’s Golden State Poll, administered by the survey research firm YouGov and designed in conjunction with Stanford's Bill Lane Center for the American West, finds Californians bearish on Trump’s prospects – 36 percent believe he’ll succeed; 46 percent say he won’t. 48 percent of Californians believe the state would be worse off if Obamacare is repealed while 34 percent said it would be better off with repeal. Other facets of the Trump agenda were above water, but not overwhelmingly so. Forty-one percent of survey respondents see ending what Trump has labeled "unfair trade practices" as a California net-positive, with 35 percent taking the opposite view. Forty percent see school vouchers for low-income kids as a positive; 29 percent believe vouchers are detrimental. For full poll results, go to the Hoover Golden State Poll. Trump reportedly said that he is writing his inaugural address with JFK's inaugural in mind. First, he is probably not writing it himself. He can barely manage a 140-character tweet without errors in spelling, punctuation, and grammar. Second, he reads little and relies heavily on ghostwriters. JFK: We observe today not a victory of party but a celebration of freedom--symbolizing an end as well as a beginning--signifying renewal as well as change. Trump: I mean think of it. We won a landslide. That was a landslide. And we didn’t have the press. The press was brutal. You know what? Hey, in the great state of Ohio, we didn’t have the upper echelon of politicians either, did we? JFK: And yet the same revolutionary beliefs for which our forebears fought are still at issue around the globe--the belief that the rights of man come not from the generosity of the state but from the hand of God. Trump: The world is not fair. You know they come with this statement "all men are created equal." Well, it sounds beautiful, and it was written by some very wonderful people and brilliant people, but it's not true because all people and all men [laughter] aren't created—now today they'd say all men and women, of course, they would have changed that statement that was made many years ago. JFK: Let the word go forth from this time and place, to friend and foe alike, that the torch has been passed to a new generation of Americans--born in this century, tempered by war, disciplined by a hard and bitter peace, proud of our ancient heritage--and unwilling to witness or permit the slow undoing of those human rights to which this nation has always been committed, and to which we are committed today at home and around the world. Trump: But, you know, the people of Crimea, from what I've heard, would rather be with Russia than where they were. And you have to look at that, also. Now, that was under -- just so you understand, that was done under Obama's administration. And as far as the Ukraine is concerned, it's a mess. And that's under the Obama's administration, with his strong ties to NATO. JFK: Let every nation know, whether it wishes us well or ill, that we shall pay any price, bear any burden, meet any hardship, support any friend, oppose any foe to assure the survival and the success of liberty. JFK: To those old allies whose cultural and spiritual origins we share, we pledge the loyalty of faithful friends. United, there is little we cannot do in a host of cooperative ventures. Divided, there is little we can do--for we dare not meet a powerful challenge at odds and split asunder. Trump: Oh sure, I know that. I mean, I understand what’s going on, I said a long time ago — that NATO had problems. Number one it was obsolete, because it was, you know, designed many, many years ago. Number two — the countries aren’t paying what they’re supposed to pay. JFK: To those new states whom we welcome to the ranks of the free, we pledge our word that one form of colonial control shall not have passed away merely to be replaced by a far more iron tyranny. We shall not always expect to find them supporting our view. But we shall always hope to find them strongly supporting their own freedom... If a free society cannot help the many who are poor, it cannot save the few who are rich. Trump: It is necessary that we invest in our infrastructure, stop sending foreign aid to countries that hate us and use that money to rebuild our tunnels, roads, bridges and schools—and nobody can do that better than me. JFK: To our sister republics south of our border, we offer a special pledge--to convert our good words into good deeds--in a new alliance for progress--to assist free men and free governments in casting off the chains of poverty. Trump: When Mexico sends its people, they're not sending their best. They're not sending you. They're not sending you. They're sending people that have lots of problems, and they're bringing those problems with us. They're bringing drugs. They're bringing crime. They're rapists. And some, I assume, are good people. JFK: To that world assembly of sovereign states, the United Nations, our last best hope in an age where the instruments of war have far outpaced the instruments of peace, we renew our pledge of support--to prevent it from becoming merely a forum for invective--to strengthen its shield of the new and the weak--and to enlarge the area in which its writ may run. Trump: The United Nations has such great potential but right now it is just a club for people to get together, talk and have a good time. So sad! JFK: And so, my fellow Americans: ask not what your country can do for you--ask what you can do for your country. Trump: I think I've made a lot of sacrifices. I work very, very hard. I've created thousands and thousands of jobs, tens of thousands of jobs, built great structures. I've done, I've had tremendous success. I think I've done a lot. JFK: My fellow citizens of the world: ask not what America will do for you, but what together we can do for the freedom of man. Finally, whether you are citizens of America or citizens of the world, ask of us here the same high standards of strength and sacrifice which we ask of you. With a good conscience our only sure reward, with history the final judge of our deeds, let us go forth to lead the land we love, asking His blessing and His help, but knowing that here on earth God's work must truly be our own. Trump: There is no global anthem. No global currency. No certificate of global citizenship. We pledge allegiance to one flag and that flag is the American flag. From now on it is going to be: America First. Okay? America first. We're going to put ourselves first. President-elect Donald Trump approaches Inauguration Day with a significantly lower favorable rating than his three immediate predecessors received when they were presidents-elect. Trump's 40% favorable rating is roughly half of what Barack Obama enjoyed before his inauguration in 2009 (78%) and is much lower than the pre-inaugural ratings for George W. Bush (62%) and Bill Clinton (66%). ...We spent two months building the dataset from public records, news reports, and other sources on the Trump family, his Cabinet picks, and top advisers — more than 1,500 people and organizations altogether. BuzzFeed News is the first news organization to publish such an exhaustive list of Trump’s business interests, and we hope it will help you, the public, better understand the new administration. Unsurprisingly, Trump voters overwhelmingly say they’d back him in a dispute against Democrats in Congress. Eighty-four percent say they’d be more likely to agree with the president-elect, with fewer than 1 percent saying they’d be inclined to side with Democrats. But a majority also say they’d be likely to support Trump over both congressional Republicans generally and Speaker Paul Ryan (R-Wis.) in particular. That’s despite the fact that Ryan is well liked among those who voted for Trump. In another recent survey, 60 percent of Trump voters said they approved of Ryan’s handling of his job as speaker, with just 24 percent disapproving. The one voice that Trump voters prioritized over the president-elect was that of the military. By a 7-point margin, 39 percent to 26 percent, a plurality say they’d be more inclined to agree with military leaders than with Trump in a political disagreement. In Gallup polling conducted two weeks before Inauguration Day, President-elect Donald Trump continues to garner historically low approval for his transition performance, with 51% of Americans disapproving of how he is handling the presidential transition and 44% approving. Last month, the public was split on this question, with 48% approving and 48% disapproving. Pew reports on a new national survey on foreign policy. Self-described progressives, many of whom backed Vermont Sen. Bernie Sanders’ presidential campaign, claimed sweeping victories in last weekend’s California Democratic Party delegate elections. They hope to influence the leadership, policies and direction of the state’s dominant political party. “This is a ringing endorsement of the new direction the Democratic Party needs, not just in California, but nationally,” said RoseAnn DeMoro, executive director of the California Nurses Association/National Nurses United, which passionately campaigned for Sanders last year. Many new delegates are nurses, the association said. Others are skeptical about whether the new delegates can dramatically change what’s already a left-of-center party. “They’re probably replacing like-minded people,” said Renee Van Vechten, a political science professor at the University of Redlands. It’s not clear how many of the 1,100 state delegate seats up for grabs were won by progressives. But liberals statewide say their slates dominated in elections held in each of California’s 80 Assembly districts on Saturday and Sunday. The district-level delegates – each district elects seven men and seven women – receive two-year terms and make up a third of the 3,200 or so delegates to the state party’s governing body, the Democratic State Central Committee. The other two-thirds come from central committees in California’s 58 counties or are appointed by Democratic elected officials and nominees. We can’t risk creating the perception that government leaders would use their official positions for profit. That’s why I was glad in November when the President-elect tweeted that he wanted to, as he put it, “in no way have a conflict of interest” with his businesses. Unfortunately, his current plan cannot achieve that goal. It’s easy to see that the current plan does not achieve anything like the clean break Rex Tillerson is making from Exxon. Stepping back from running his business is meaningless from a conflict of interest perspective. The Presidency is a full-time job and he would’ve had to step back anyway. The idea of setting up a trust to hold his operating businesses adds nothing to the equation. This is not a blind trust—it’s not even close. I think Politico called this a “half-blind” trust, but it’s not even halfway blind. The only thing this has in common with a blind trust is the label, “trust.” His sons are still running the businesses, and, of course, he knows what he owns. His own attorney said today that he can’t “un-know” that he owns Trump tower. The same is true of his other holdings. The idea of limiting direct communication about the business is wholly inadequate. That’s not how a blind trust works. There’s not supposed to be any information at all. This isn’t the way the Presidency has worked since Congress passed the Ethics in Government Act in 1978 in the immediate aftermath of the Watergate scandal. Since then, Presidents Jimmy Carter, Ronald Reagan, George H.W. Bush, Bill Clinton, George W. Bush, and Barack Obama all either established blind trusts or limited their investments to non-conflicting assets like diversified mutual funds, which are exempt under the conflict of interest law. Morgan Lewis, a law firm representing President-elect Donald Trump, was named the "Russia Law Firm of the Year" last year by a group that ranks legal organizations. Facing the press Wednesday for the first time since being elected president, Trump yielded a significant part of his news conference to an attorney from the law firm, which is helping separate him from his various business ties. In highlighting its receipt of the Russia award, Morgan Lewis' website cites Chambers and Partners. "This active Moscow office of an American firm offers top-level advice in regards to the energy sector and also houses very strong banking and M&A teams," Chambers and Partners writes about the award.